Madeline Mann once weighed less than a can of soda as the tiniest surviving newborn known to medicine. Next week, she enters high school as something even more extraordinary -- an honor student who plays violin and likes to Rollerblade. At birth, she wasn't even pint-sized. 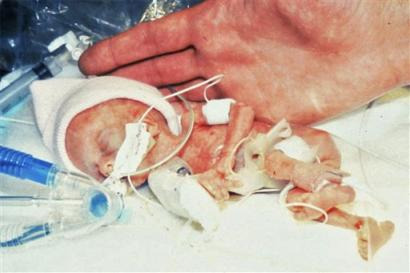 Born 27 weeks into her mother's pregnancy, she weighed just 9.9 ounces, less than any surviving baby in medical history. She was just 10 inches long, smaller than a football and resting easily in a nurse's hand. Read more about Madeline here. Incredible story! I couldn't imagine the pain the parents went through, hoping and praying for their little girl to pull through. I'm very happy to see she has, and is healthy and entering high school. God works in mysterious ways and we shall never question it. I wish the best of luck to the family and the not so little girl anymore. i can't believe the baby made it....i'm glad that she made it and is doing good in life. that baby is so cute i am so gald she made it now thats how you no some mircales do happen i mean look this baby has survived ..i am so happy for yall...well email me and let me no how she doing today...i am 17 years old and i couldnt imagen wat yall went trough i guess all that matters is that shes a live...lots of love!!!!!!!!!!!!! !